Ottawa Glandorf’s Saleigha Ellerbrock hits a spike against Liberty-Benton’s Hannah Warrington during Thursday night’s Division III district final at Kalida. See more volleyball photos at LimaScores.com. Ottawa-Glandorf’s Maddie White hits a shot against Liberty-Benton’s Hannah Warrington (3) and Caitlin Elseser during Thursday night’s Division III district final at Kalida. KALIDA — Ottawa-Glandorf and Liberty-Benton, ranked No. 1 and 2 respectively in Division III, met up Thursday night with a trip to regionals on the line. The Eagles emerge with an 18-25, 25-19, 25-11, 22-25, 18-16 district final victory. The Eagles (26-0) advance to take on Willard 7:30 p.m. Thursday. Tied at two sets apiece, the biggest lead by either team was two points, all three times by the Eagles. Their stars stepped up big-time: the Titans’ Taylor Alt (25 kills), Erica Annesser (20 kills) and Claire Eiden (18 digs) versus the Eagles’ Caitlin Elseser (10 kills, 9 blocks), Isabella Granger (20 kills) and Hannah Warrington (22 kills). The set came down the very end as L-B scored the last three points of the match. With O-G up 16-15 on a bomb by Alt, L-B’s Schy Shepherd (nine blocks, nine kills) put one down to re-tie it at 16. A hitting error gave the match point to the Eagles and when Granger put a spike off a defender, the Eagles had survived. The opening set saw Alt and Maddie White (four blocks) lead the way at the net, along with setters such as Brianna Schimmoeller (19 assists) and Kendra Ellerbrock (14 assists). They showed more consistency with their play, especially the hitting, and used their weapons at the net slightly better. They opened up a 24-14 lead on a bash by Alt and received a kill by Annesser to take the opener. The second set was tight most of the way, as neither team could get on much of a run. The score stood at 15-15 but when the Titans committed a service error, that seemed to give the Eagles some momentum. 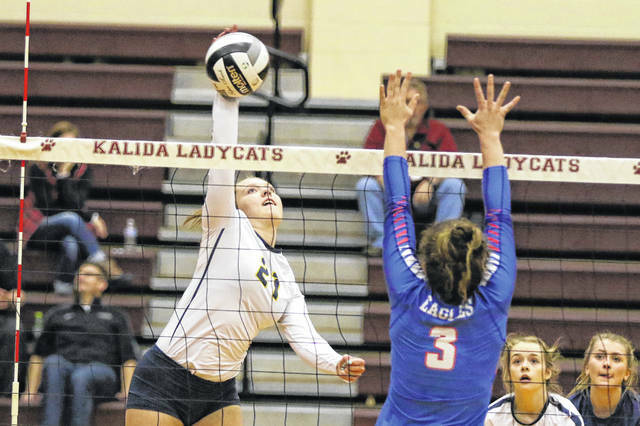 With their defense taking control – getting four straight stuffs during a key stretch – that gave the Eagles a chance to tie the match at a set each and when Warrington put down a spike of the defense, the match was even. The third set saw L-B get off much quicker and built the momentum from there. With the likes of Elseser and Granger leading, they steadily added to their lead and pulled away to a convincing set. They used a key 8-0 stretch to grab a 16-point lead and finished off the dominating set on a bash off the defense by Granger to go up 2-sets to one. The fourth set saw the Titans regain their level of play as it went on. Neither team could get on a major run until O-G built a 15-13 lead to 20-13 as Alt again set the pace with three kills in a five-point stretch. The Eagles didn’t go away quietly and got within 23-22 on a kill by Granger before back-to-back by Annesser and Alt forced a deciding fifth set. 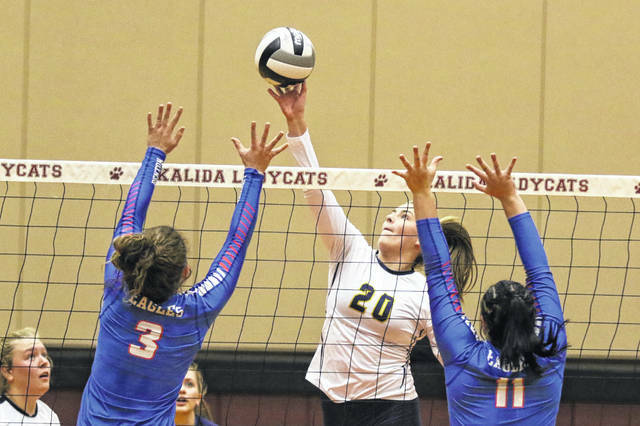 Ellerbrock saw the high school volleyball careers of seniors Alaina Schimmoeller, Kasey Ellerbrock, Emily Wischmeyer, Alyssa Gerten and Kendra Ellerbrock come to an end. and did what we needed them to do,” Ellerbrock said. “They may not have gotten the stats but they accepted whatever the roles we asked them to do to make us a better team. Outside a few times tonight, we were never out of our system and that is a testament to the five seniors and the leadership they showed tonight. Alissa Rhodes led the Eagles with 56 assists, with Chloe Miller topping the dig department with 20.